The yacht has a Wide Body with Raised Pilot House (RPH) and supremely sleek exteriors, featuring exceptionally sized full-height windows in both the bow and salon. Unique in this category is the option to add an additional sundeck (almost 30m2) on a third level, with access from the upper deck in the stern. This solution doesn’t affect the balance of volumes and retains the model’s overall dynamism. With a maximum beam of 7.5 meters, the wide-body Grande 35 METRI has all the features of even bigger superyachts, like the side garage for a 5 meter tender plus a 3.25 meter jet-ski. This leaves the stern completely free for a magnificent 12 m2 beach area provided by the big pivoting swim platform. A second surprising lounge or beach club area in the bow (30 m2, excluding the side walkways) is fitted with sofas, a sun lounging area and a hydro massage tub. The spacious deck area in front the tub is in fact a platform that can be raised using an electrohydraulic mechanism to gain access to the winches and fender racks beneath. The trapezoidal bow (one of Righini’s hallmarks) provides plenty of space and even more comfort throughout the area during both mooring operations and navigation. The main deck contains the owner’s suite, which transmits the same sensation of openness and lightness, where the king size central bed becomes the main feature around which the entire space revolves. The highpoint of the owner’s suite is its unique private balcony, which is unprecedented on a 35 meter yacht. Using a mechanism that is highly sophisticated but extremely straightforward, the section of the full-height window with a carbon fiber frame folds out, while the floor of the balcony extends from under the cabin, protected by automatic pop up stanchions. The result is the Instant Balcony, with no uprights or other obstacles to spoil the panoramic view from the owner’s suite. Below deck, the layout includes four guest cabins (two VIP cabins with double beds and two with twin beds), with access from a big central lobby.One of the standout features of the Azimut Grande 35 METRI’s interiors is the spiral staircase, which connects all the decks, from the lower deck to the pilot house. The backlit onyx steps have different finishings on their external and internal sides (white lacquer and mother of pearl respectively), as if to confirm just how exclusive the design is. In the bow, in a space that is completely separate from the guest area, the quarters for the six members of crew consist of a crew mess, four cabins and four bathrooms. 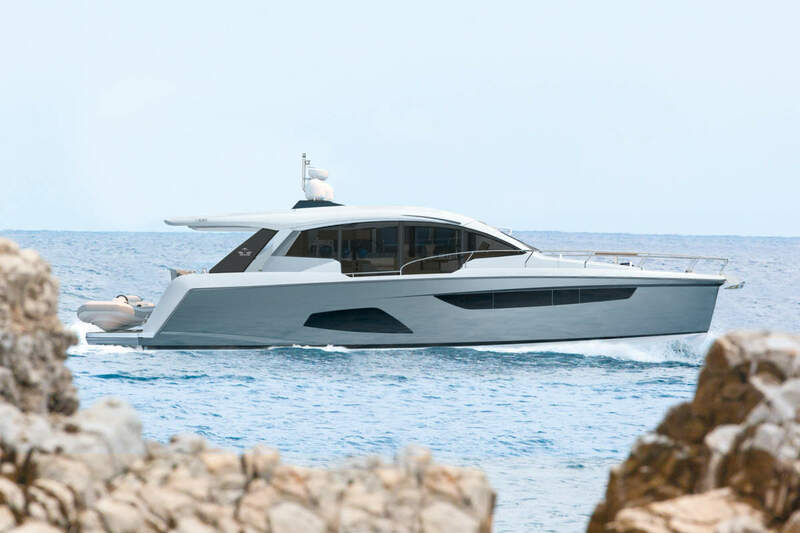 The D2P_Displacement to Planing® hull, designed by Pierluigi Ausonio in conjunction with the Azimut Benetti Research & Development center, combines the comfort typical of a displacement hull with the performance of a planing hull and a wave piercer to improve fuel efficiency. The D2P hull with wave 3 piercer means the yacht can reach high top speeds without needing particularly powerful engines, or navigate in displacement mode with a remarkable range at a cost effective speed. The hull has been optimised for the full range of most frequently used speeds, including both long range displacement mode speeds of 10-12 knots and cruising speeds in semi-displacement mode. cruising speed of 21 knots and a top speed of 25.5 knots. The Azimut Grande 35 METRI is the top of the range in the Grande Collection, representing a step forward in the search for new solutions that benefit owners in terms of their technology, design, comfort and navigation efficiency. It’s hard not to use words such as soul and passion when faced with such beauty from Italy, the proverbial cliche swear box is indeed full after this review, and for all the right reasons, the Grande 35M doesn’t disappoint.